Two studies have shown that sick building syndrome and hanging around indoors can actually make you sick. Scientists have long known that increased levels of carbon dioxide (CO2) contribute to global warming and, in turn, harm the environment, but thought that indoor levels of CO2 weren’t particularly harmful to occupants. They were wrong. A study conducted in 2012 by the Department of Energy’s Lawrence Berkeley National Laboratory assessed the effects of CO2 in enclosed spaces, where concentrations of the gas may be higher because of recirculated air. In a controlled setting meant to mimic an office environment, participants were subjected to increasing levels of CO2, ultimately reaching amounts people would experience during a typical working day. As a benchmark, typical CO2 levels in outdoor air are 400 parts per million (ppm), where facility managers try to keep CO2 levels indoors below 1,000 ppm, through ventilation and air circulation. However, researchers found that crowding in office spaces of conference rooms could bring CO2 levels up to 2,500 ppm; according to Berkley scientists, classroom levels in schools can reach 3,000 ppm. In the study, participants were given computer-based decision assessment tests once they had acclimated to increased CO2 levels. The result: the participants had impaired thinking processes, couldn’t concentrate and reached “dysfunctional” levels of performance. The most recent study, conducted by Harvard University, SUNY Upstate Medical Center and Syracuse University used a similar approach and confirmed the earlier test’s results. Researchers were shocked that insignificant increased in CO2 levels could impair function that quickly. According to a recent paper published by Joseph Allen, an assistant professor of exposure assessment science at Harvard, increasing ventilation is one way to combat the CO2 problem and Sick Building Syndrome—the conditions, like headaches, respiratory problems and cognitive impairment, brought on by indoor air pollutants. He estimates doubling current ventilation rates in buildings would amount to a cost of $40 per occupant per year, but would provide a productivity gain of $6,500 per person per year, offsetting any costs and providing companies more revenue via productivity. 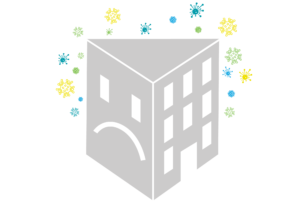 Another way to combat Sick Building Syndrome is by reducing overcrowding in conference rooms, offices, building and classrooms; given that people exhale CO2, close quarters can contribute to the problem. A third way is addressing the air quality itself. While AeraMax Professional air purifier doesn’t remove CO2, it is extremely effective at removing debilitating viruses, allergens, and VOCs and purifying indoor air through a four-stage filtration system.